After a few days of exploring Port Fitzroy on Great Barrier Island, we thought it was a good time to make passage to the Bay of Islands, our last NZ stop before our offshore passage to Noumea. 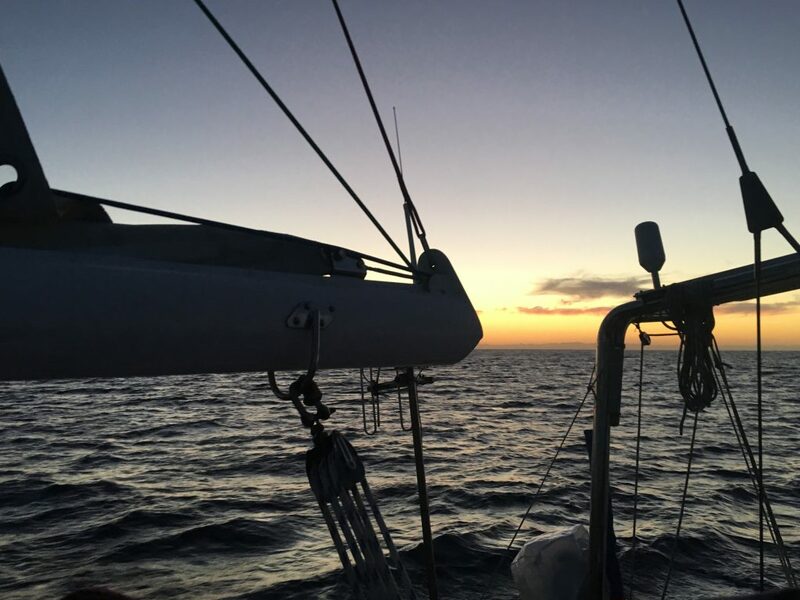 The sail was likely to take us 14 hours so instead of leaving in the dark and arriving in the dark, we decided to make passage overnight, leaving and arriving in daylight, but best of all, allowing us a night sail. Sailing at night is my favourite type of sailing, this particular night was an ideal sailing night. 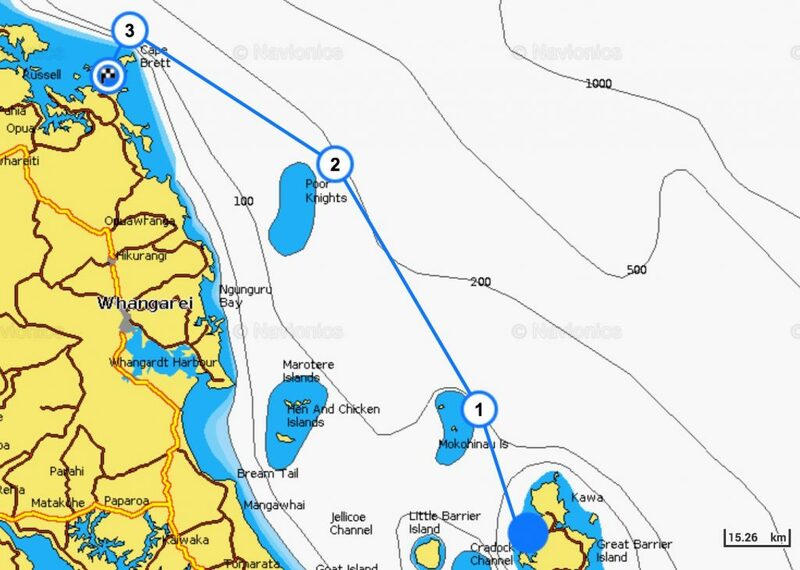 We had good winds, 20kn with gusts of 25kn, we put in a reef (reduced the sail size to make the boat easier to handle) and headed out into the open sea, sailing a course around the outside of the outlying islands off the coast of NZ to keep things easy. With the clear sky, you can steer to the stars, we turn off all the unneeded systems, the engine, the autopilot, the bright chartplotter and the sky becomes alight with stars. Before the moon rise (midnight tonight), stars are the only light. At the wheel you can pick a star, line it up with some rigging or other part of the boat and keep steering a straight course, for a while at least. Tonight was a good planet night – Jupiter was my lead for a while, and as Jupiter rolled across the sky, a new star was needed, a bright star that was in the right spot was Sirius, the Dog Star (fitting eh?). As Sirius wheeled away, Castor and Pollux, the twin brothers lead the way. Each time a new star came a long, I’d quickly check Star Walk on my phone to see what I was steering to, and maybe even take a quick look at the stories behind them. I’m not unique when I say this is a time when I feel connected to nature and the universe as a whole, I’ve read it before in books and blogs written by many others. It is true though: the boat, the wind, the stars, the sea and you, come together in motion. It’s hard also, not to feel aware of the thousands of years that humans have done this before me, and that somehow it’s in our DNA to do it, it feels instinctual. The other part of night sailing that I love is the shooting stars, if you are constantly looking at the sky, the number of shooting stars is astounding. It feels like only minutes pass between each of them, although time does get a bit weird when sailing at night. This night I was treated to a very low shooting star that crackled crisply as it burned up across the atmosphere. The stars also spread into the sea, the planets cast a coloured reflection across the water, but the tiny bioluminescent sea creatures glow blue and green in the disturbed water around the boat. I enjoyed this night sail so much that I stayed on watch most of the night, but as I was feeling more and more tired, I needed a hand, so I woke Clare to join me and watch the sunrise. It’s much colder on the water than on land, and the sun coming up over the horizon is amazing as it brings light and warmth and it feels so good. I love this post Robin. It felt like I was sailing right there with you! So fascinating to read about your night sailing ! 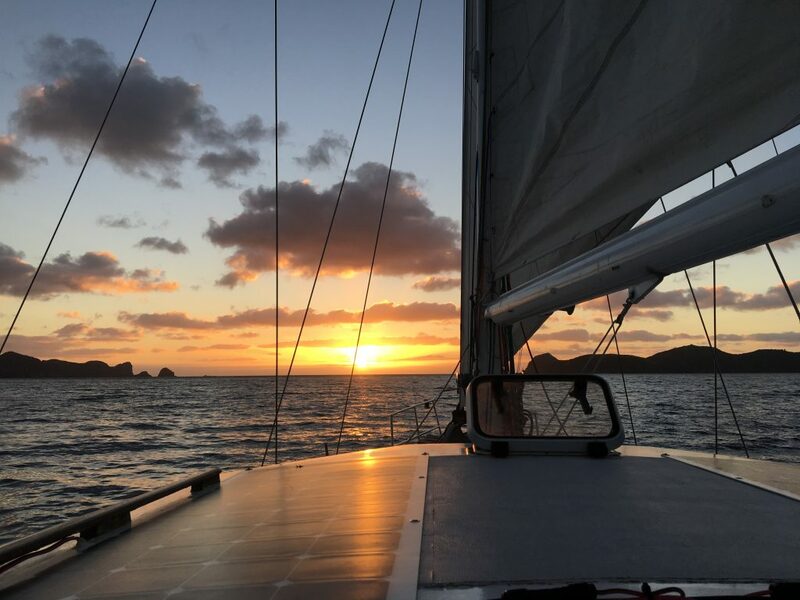 Have a nice sailing to Nouméa ! You just missed our Président Macron visiting New Caledonia not very long ago 😄. Love to the 3 of you. These new young leaders (like our Jacinda Ardern) are super refreshing aren’t they? I have great hope for us humans. Love to you all. Finally catching up with your adventures. I hear there were some exciting soggy moments on the crossing? Please teleport us to New Caledonia. I’m standing in the kitchen cooking tomato and lentil soup wearing an apron, ugg boots and woolly beanie (yes, yes, other things too). Night sailing sounds utterly magic. Almost makes we think we could take to the high seas one day. I’m put off however by the vomit, the cold, the tangly, tripping ropes and irrational fear of the whole thing capsizing and sinking. But the sunrises, snorkling and beer on calm seas are appealing. And no lawns to mow!! I must go down to the sea again, to the lonely sea and the sky.